I thought I'd post a bit about a model I just completed the other day, and throw in some pictures and details of the build process. The idea for me was to build a model that would make the best possible use of a power setup I had laying around, namely a 1300 Kv brushless outrunner, and 18 amp ESC, and a 10c 1300 mAh 3S battery. The prop I chose to use was a bit of a compromise; a vintage yellow nylon 7-4 prop. The first step was to get the model designed, and I started with a rough sketch on the computer. 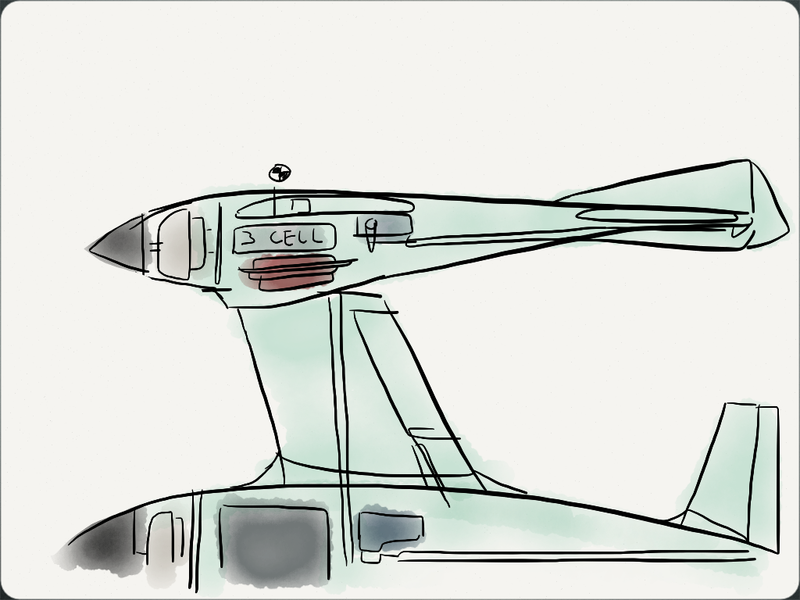 Originally, I assumed the model would have a very forward centre of gravity, so I compensated with a forward swept wing to bring the mean aerodynamic chord close to where I wanted it. Any landing you can walk away from probably wasn't that exciting to watch. I had a general idea of the wing area, tail moment and the horizontal stabiliser area. To set the centre of gravity, I kept the wing root at a constant distance, and played with the wing sweep until the C of G lay within reason. Before I commited to the design, I started work on the fuselage, as this was now a constant. With the components taped in place, and as the battery location could not be used, I found where it balanced and then matched this up with the data from the online calculator so that it would be slightly nose heavy - something ideal for a faster and smaller ship than I am used to. So here's the final specs for my bird, done up quickly in MS paint. At this point, I figured it would be safe to start cutting foam in earnest, and I'd have to just hope and pray nothing was amiss, especially with no room to shift the battery or add weight! I first hollowed out the centre foam section to make room for the battery slot, the micro Hitec 4 channel reciever, a "Y" harness and the 18 amp ESC. I sandwiched this between two more 1 inch pieces of insulation foam and a considerable amount of wood glue. 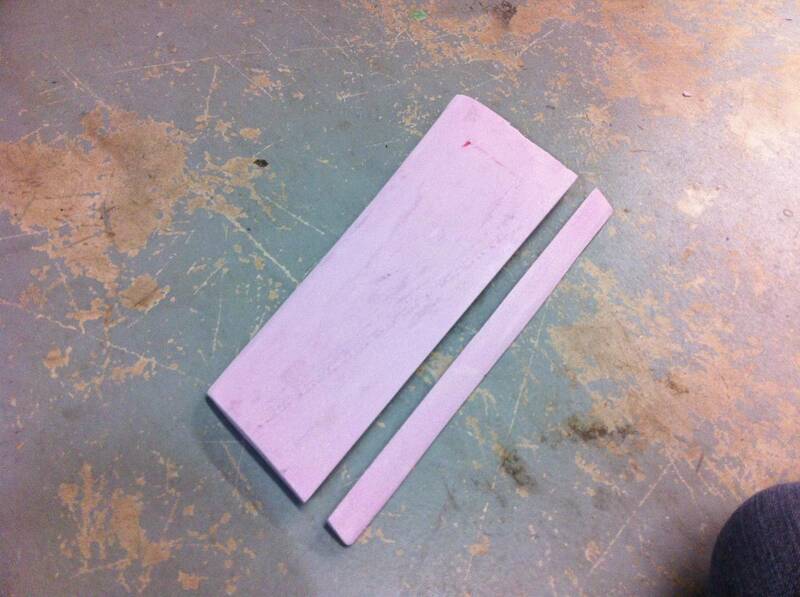 Next, out came the sanding block, and reduced my clean workshop into a pink dust Sahara Desert. As this model was not to be a really "Van Gogh" quality piece of work, I stuck with 300 grit the whole way. 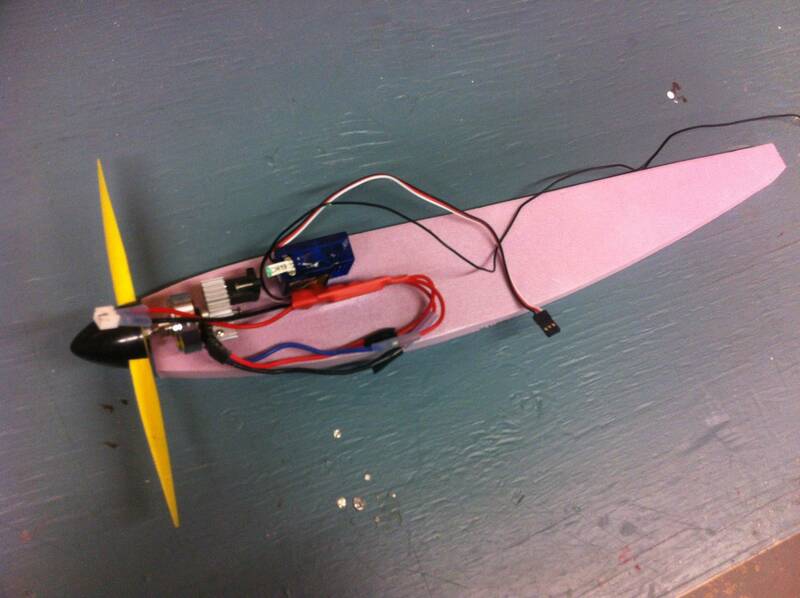 The motor mount was cut out from 1/4 inch hard balsa, which was epoxied to directly to the foam. Before continuing, I mounted the motor and cut a hole for the wires, as it was going to be hidden inside a non-removable foam cowling. A quick check had everything in order, and I could move onto covering the fuselage. A cyclone of covering film and iron burns followed and resulted in this rather miniscule fuselage. I am using generic brand covering from Hobbyking, and found it to be very nice to work with, similar to Ultracote / Oracover. Some bubbles did show up, probably from gasses escaping from the foam when heated, but I am not too concerned and left most as is. The bigger ones I perforated with a pin and re-ironed. At this point, I also cut out a hole for the elevator servo on the top of the fuselage. I kept it as flush as possible, so that only the arm is exposed. You can also see the horizontal stabiliser, which was cut from some scrap balsa I had laying around. I'm using covering hinges just for the weight savings, but tape hinges would probably work too. Sorry for the rather grainy picture - I think there was still foam dust on my phone's camera lense! 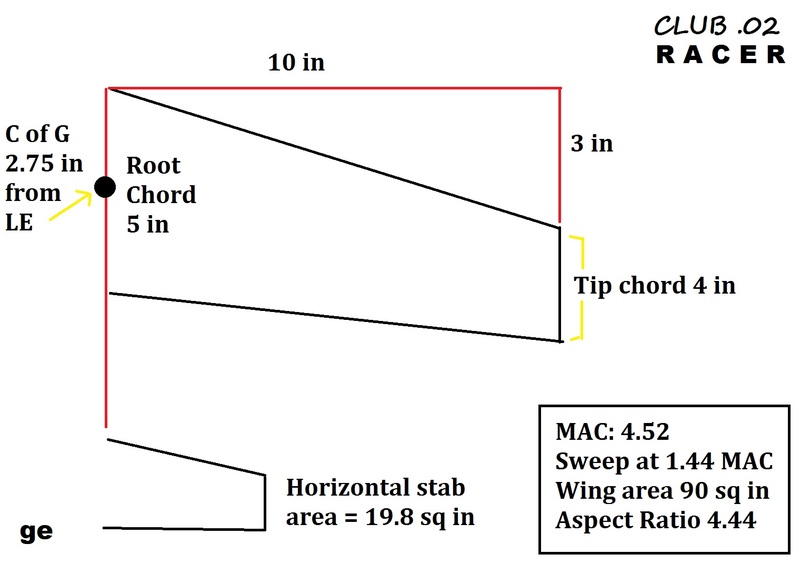 I didn't have any specific airfoil picked out for this design, and frankly, at this size (and with these Reynolds numbers), I think the difference between a dozen or so elliptical or semi-elliptical airfoil would be negligible. I used a Sharpie and a ruler to mark out each wing planform on a sheet of foam, and then cut both out with a knife. 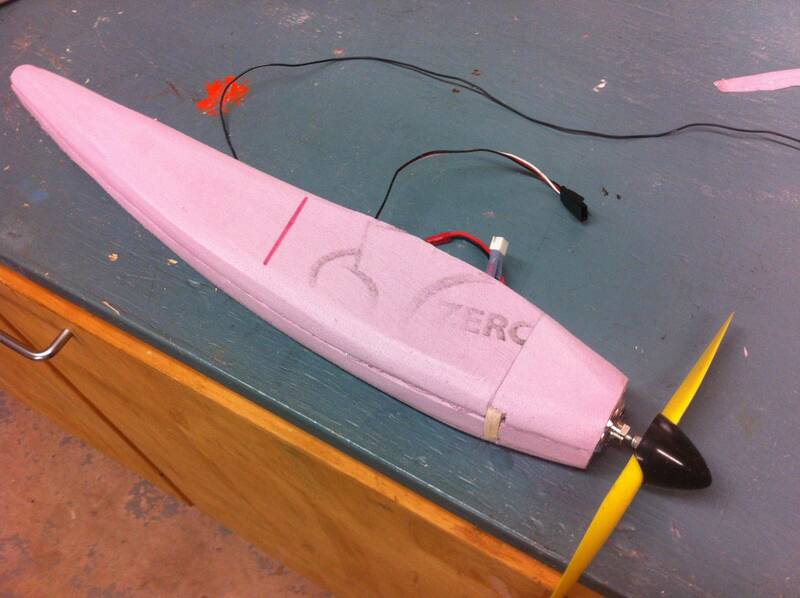 The airfoil was sanded to shape in about half an hour for both panels. I found a bit of filler was needed on the wing root of the left panel to give it the correct shape. The ailerons were then cut out, and hinged with the same black covering I used on the fuselage. Each wing also got a cutout for a servo at this stage. Pushrods were fabricated from music wire, and again I fired up the model to test the elevator before moving on. The aileron servos were glued into the wing cutouts, and once I fitted them with their respective control horns and pushrods, tested. The wings were attached first by skewering the fuselage with a cut-off bicycle spoke and using this as a wing spar, then removing the covering from the wing root and fuselage, and finally using epoxy to hold it all together. The biggest issue at this point, and the hardest part of the build, was now trying to cram the servo extension, "Y" harness, ESC, and 3 cell battery into the slot in the fuselage. Initially, the battery would be fine on its own, but with the leads and wires, it was very hard to position everything so that the top of the pack would be flush with the top of the fuselage. I had to spend some time with a knife cutting away some more foam inside the model to give some more room, and finally managed to fix everything inside so that it fits without pinching wires or having to force the battery in. Of course, the cooling for the inner components is non-existant, so I'm glad I went overboard with the speed control! You can see below the just-about-complete model is tiny with only 23 inches of wingspan. Finally, here's a pic following her maiden flight over the St Mary's river. I chose a 1000 mAh 2S pack, and was expecting pretty lethargic performance to get trim in order. It wasn't too gusty, but still windy enough that I was second guessing my decision to fly. After a hard and level overhead javelin throw, she was off and picking up speed at a great pace. Right off the bench, trim seemed fine, and I'm glad it was; Elevator control was sensitive, but not overly so. However, anything above half up would cause a snap to the left, something I'm attributing to the high wing loading. 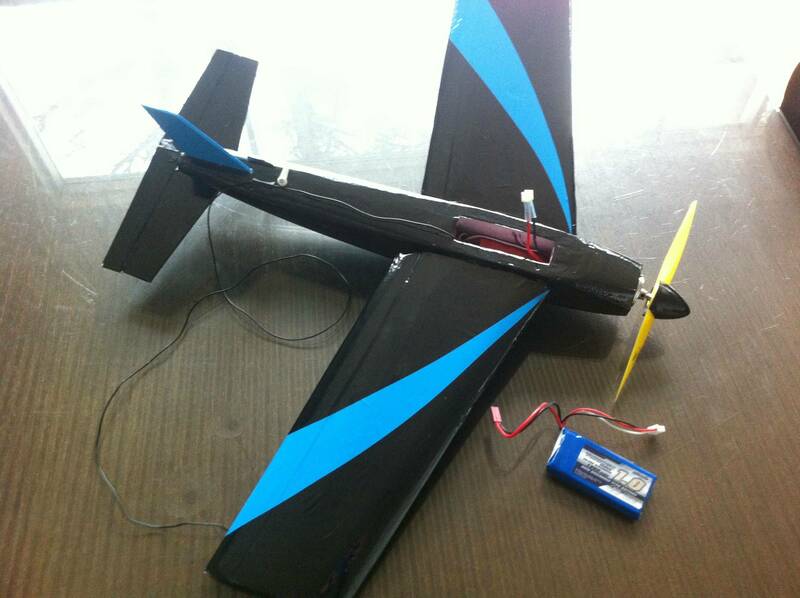 Ailerons are light and responsive- very "racer" like - and not too touchy. I didn't try any aerobatics or slow / high alpha manuevers for the first flight, but found that when the throttle was dropped, it slowed down quickly with the nose held up. Landing was quite fast, however, and I though I damaged to motor mount because it dropped the nose rather suddenly about a foot above the beach. 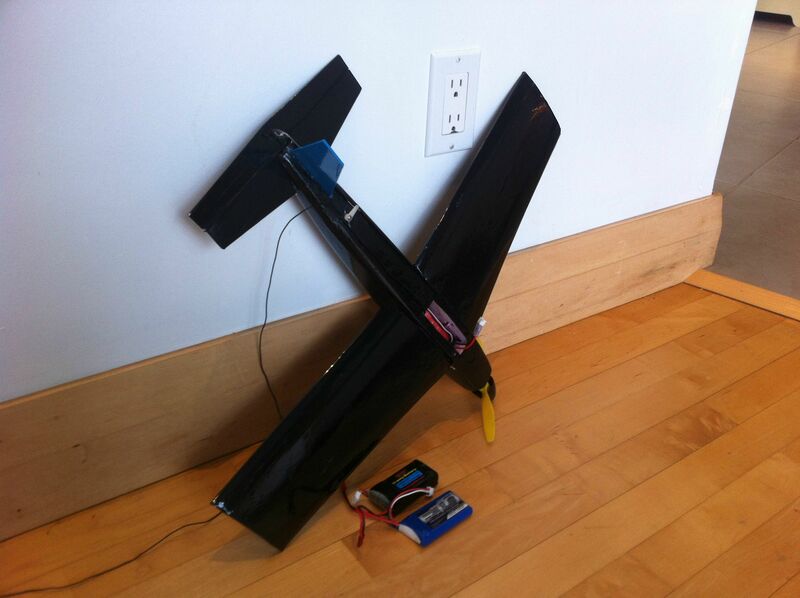 No damage, though, and the components were only marginally warm for a three minute first flight at full throttle. Seeing as this model has given me the best impression of "speed" of anything I own, I can't wait to try it with the 3S pack! Crashed the Racer the other day, but luckily a terminal dive from 50 feet WOT into a lake = no discernable damage! The cause is giving me headaches, though. It seemed to me that the range was compromised. From handlaunch, all seemed good, but once the aircraft reached about 40 feet away, it began to glitch, and there was little control whatsoever. I managed to bring it around for a close pass, and control was regained. My final mistake was letting it go out over the lake in setting up a "proper" approach. Here I lost control once more and she nosed down at full power. I fully expected a crumpled airframe, a smoking LiPo, or both, but I had wrapped the battery lead -to-ESC connection with electrical tape out of precaution, which saved myself from bigger problems. I pulled the electronics out and let them dry for a day before plugging everything back together and trying to determine the cause of the crash. What I was expecting was the range check to fail as a result of my setup somehwere, but this was not the case. Antenna collapsed, the range was in excess of 50 feet, motor off and motor at full throttle, and at various angles. There was no glitching at any time during testing, and the battery was left at whatever remained fo the charge from the day before. I flew my parkflyer Sopwith Pup immediately following the crash, and at much further range, which in my mind rules out the transmitter failing or interference from another source. Even though the range check passed, I'm skeptical about flying this model again until I can sort out a cause. I may swap in a cheap 2.4 gHz radio for the time being just to cut out the Tx, Rx, and associated frequency issues from the picture. Bad Luck about Crashing ... Awesome Design IWANTONESOOBAD! I have not had much time to do a NTSB style investigation on the accident, but I hope to have her back in the air in short order. 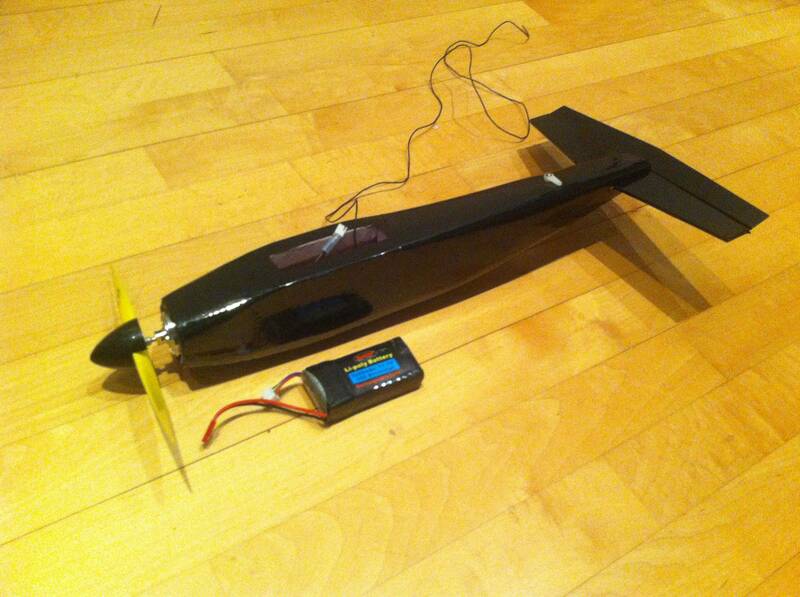 In the mean time, I picked up a smaller 6 x 5 prop...still not fast enough!